WWE Elimination Chamber is now behind us and despite the card being on the lighter side, it was a good show and went along at a brisk pace. History was made in the opening match of Elimination Chamber as the first WWE Women's Tag-Team Champions were crowned. We also saw a number of surprising title changes during the show including a new Intercontinental Champion. In this article, we run down all the surprising booking decisions WWE made at Elimination Chamber and take a look at the possible reasons behind them. I don't know about you guys but I was really looking forward to Ronda Rousey defending the RAW Women's Championship against Ruby Riott. Riott has really brought her A-game in the last few months and I was ready for another competitive match on the level of Banks vs Rousey. However, WWE decided to go in a different direction because of the post-match angle where Becky Lynch came out and beat down Charlotte and Rousey. Regardless, I still think that this match should have gone at least 5 minutes with being given the chance to dish out some offense instead of immediately tapping to the armbar. 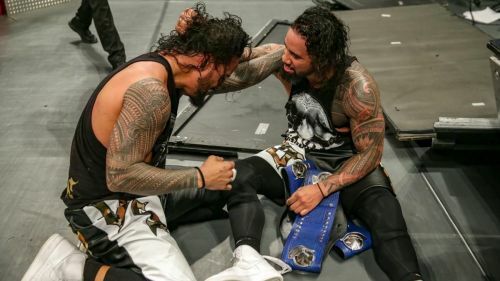 We saw new WWE SmackDown Tag-Team Champions crowned at Elimination Chamber as The Usos beat Shane McMahon and The Miz. Despite the surprise, this decision makes total sense with WWE seemingly planning for a singles match between Shane McMahon and The Miz at WrestleMania 35. WWE already teased tension between them backstage after the match and we can expect it to escalate on SmackDown Live.